If you have suffered the trauma of being involved in a claim or dispute and your Solicitor has negligently lost or damaged your claim or defence by failing to comply with the correct procedure your claim has been struck out you will not only have suffered a loss but will rightly feel badly let down. It is important to realise in these circumstances that not all Solicitors are the same and that if you had a good enough claim or defence which was lost or damaged by a negligent Solicitor you should be able to recover the compensation you deserve, through a professional negligence claim against the Solicitor. We specialise in these claims and have recovered millions of pounds worth of compensation for our clients. If you need help with a procedural error solicitor negligence claim, please call us as soon as possible on 0800 043 9981 or dial 0333 577 0172 from a mobile or complete our Free Online Enquiry and we’ll be happy to have a no obligation chat with you and explain your legal rights and options. If your case is struck out you are more likely to notice that a serious problem has occurred, however, non-compliance with a deadline for the service of expert or witness evidence will often result in the imposition of an automatic sanction that you can not rely upon the evidence served out of time. If this has occurred as a result of your Solicitor’s negligence it is likely that you will have a good claim in negligence against them for the harm caused to your case, which might be the difference between the outcome you did achieve and the outcome you might have achieved with all of your evidence, subject to a loss of chance discount. If your claim has been struck out, please do not delay. Call us free on 0800 043 9981 or 0333 577 0172, complete a Free Online Enquiry or email us on enquiry@matthewwilkinson.co.uk. We’ll have a no obligation chat with you about what you need and what you hope to achieve. We’ll happily answer any questions or queries you have and give you advice on how to progress your matter. In other types of claims including Employment Cases, other Tribunal proceedings and Family cases there are sometimes time limits within which certain procedural steps need to be taken and these too can have sanctions attached or subsequently imposed leading to the loss of or harm to your case. Unless Orders are a familiar feature of many types of claims, whereby the Court or Tribunal directs that unless a party complies with a direction or Order by a certain date their case will be struck out or some other sanction imposed. Further, when seeking an extension of time or relief from sanctions where the new Civil Procedure rules do not apply there is already evidence that the new robust approach in the post Jackson regime will be applied to interpretation of the rules of procedure of the Court or Tribunal determining the matter and Solicitors who fail to take timely action or advise their Clients to do so could be liable in negligence for any loss caused. There are unfortunately many ways in which a claim or defence can be damaged or lost due to a Solicitor’s mistake and this risk has increased with the implementation of the Jackson Reforms in the Civil Justice system and the interpretation of the new rules by the Court of Appeal not least in the notorious Mitchell v News Group Newspapers Limited decision in November 2013 not to grant relief from sanctions to Mr Mitchell when his Solicitors failed to file their costs budget on time. Costs budgets are a new requirement under the post Jackson reforms. The effect of the decision is that if Mr Mitchell wins his libel claim he will not be able to recover any of his costs other than Court fees. There have been numerous examples of cases since November 2013 where the Courts have followed this robust approach to compliance with the rules, whereby save for trivial errors or those where there is a very good excuse, the individual litigant will suffer loss of or damage to their case (depending upon the sanction imposed by the rules or the Court) with the apparent object of achieving the greater good of the smooth running of the administration of justice. In civil cases there is now the risk that the failure to comply with any rule or Order could result in the imposition of automatic sanctions or sanctions imposed after the event in respect of a breach. A Solicitor conducting a civil claim or defence for you is under a duty to advise you of the relevant rules and Orders and their effect on your case and of all steps necessary to comply with them. A Solicitor conducting litigation on your behalf would normally be expected to ensure that you comply with all rules and Orders and any timetable and deadlines set by the rules or the Court unless compliance cannot be achieved due to the failure of the client or any third party. However, in the latter event the Solicitor would still be under a duty to advise you as to what needed to be done to achieve compliance, by whom and when, what steps were necessary to comply within any deadline and if it became likely that the deadline could not be met of the need to apply for an extension of time before the deadline expired. The failure to file a costs budget on time is now widely known as a serious error, which results in the loss of the chance to recover any costs other than Court fees from the other side in the case. If this was a loss that would not have occurred but for the Solicitors procedural error, there should be a good claim in professional negligence against the Solicitor. However, there are many other ways in which a case could now be lost or harmed as every step in a civil claim is set to a timetable controlled by the Court. Each stage of the case includes deadlines as to the production or disclosure of documents and expert evidence and witness statements and failure to comply on time could have serious consequences including the striking out of the case or the inability to rely on all or part of your expert or witness evidence. The Court can also impose Orders requiring you or your Solicitor to do things even within a short specified time and with a sanction imposed within the order so that if you fail to comply your case could be struck out or your evidence not allowed. If it is unlikely that you will be able to comply within any time period set by the rules or the Court your Solicitor ought to advise you to make an immediate application for an extension of time before the deadline expires and failure to do so would be negligent, even if the Solicitor was not responsible for your inability to comply with the original deadline. Whatever the reason for your claim not being able to proceed, we are confident that we can help you obtain proper redress and compensation for your loss in a professional negligence claim against your Solicitor. It is important to use an experienced team when it comes to making any sort of claim against a Solicitor or other legal professional because these cases are often complex and difficult and the Solicitors and Lawyers’ Insurers will use many legal arguments to challenge your claim. This is particularly the case when the subject matter of the claim is a previous claim, defence or dispute. When a claim or defence is affected by a procedural error there are often difficult aspects to the case, which led the Solicitor to make a mistake. This gives the Solicitors’ Insurers the opportunity to argue that it was not their fault, or that even if there was negligence, your claim would not have succeeded or you would not have obtained the outcome, which you say was lost by the Solicitor. 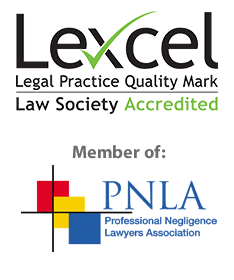 We have specific experience of pursuing very many successful claims against Solicitors where the Solicitor has lost or harmed the claim or defence as a result of their negligence, including many claims where the original claim or defence was lost or harmed by a procedural error caused by the Solicitors’ Negligence. If your Solicitor or Barrister has made procedural errors seriously damaging your case, or, if your claim has been struck out, please do not delay. Call us free on 0800 043 9981 or 0333 577 0172, complete a Free Online Enquiry or email us on enquiry@matthewwilkinson.co.uk. We’ll have a no obligation chat with you about what you need and what you hope to achieve. We’ll happily answer any questions or queries you have and give you advice on how to progress your matter. We are committed to protecting your information and privacy in accordance with the law and will only use your information for the purposes of dealing with your enquiry and in accordance with our, which can be found by clicking on this link.